The switched reluctance motor appears doomed to low energy efficiency. What about using linear induction motor design instead? It holds great promise, since it is not limited by iron's saturation at field strengths around 1 Tesla. Braam Daniels is a talented engineering student at the University of Cape Town, South Africa. He designed and built a low-energy PLIM, but more importantly he's written a brilliant thesis paper. Braam's paper is published here with his permission and support. "A small single stage pulsed co-axial linear induction motor was designed and constructed to verify the computational simulation used in its development, and to determine the feasibility of the operating concept at low voltages and energy inputs of 400 volts and of 25 joules respectively. 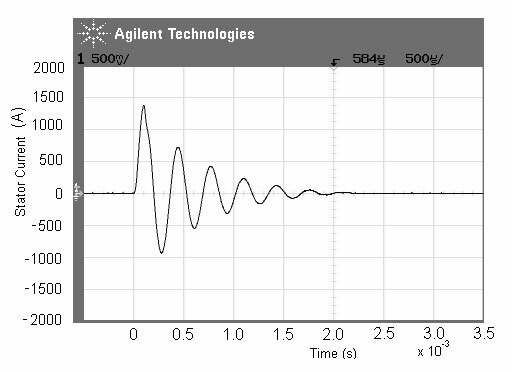 The suitability of the Insulated Gate Bi-polar Transistor (IGBT) in such a launcher system was also investigated. Moreover, the system uses wire wound helical armature coils as opposed to conventional conductiong rings to greatly enhance the mutual induction between the stator and armature. Research was conducted through a comprehensive literature review providing detailed and concise information regarding the theoretical modeling of the system and important design considerations. Information was extracted from research published in the IEEE Transactions on Magnetics and similar journals, supplemented by numerous books and device data sheets and application notes. In practice the operation of the device was compared to the theoretical model mainly in terms of the tank circuit current magnitude, oscillation frequency and qualitative observations of the mechanical performance. Despite much of the theoretical model being to some extent verified, this project has found that pulsed co-axial linear induction motors are not effective if designed to operate at low voltages. It is also concluded that the idealized assumptions which neglect mechanical friction and more specifically the IGBT on-state resistance are not valid at these low energy inputs." The ultimate objective is to build a six-stage launcher system with a total energy storage of about 150 joules. 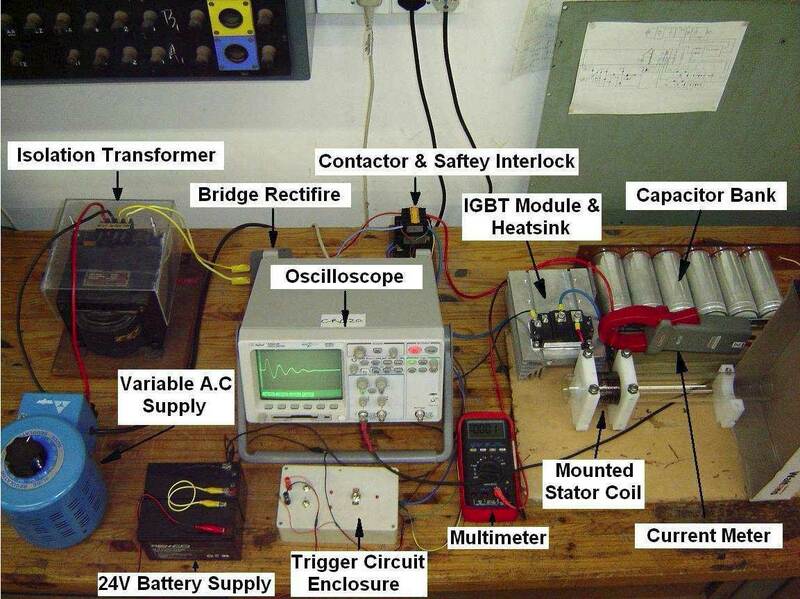 This project is only the first stage (around 25 joules) for feasibility testing. The induction motor has special capacitors; by choosing polypropylene capacitors the system does not require anti-parallel protection diodes. This allows full scale oscillation without damaging the capacitors. It is this "ringing" that is essential to induction motors. These AC capacitors are commonly found in motor-start and motor-run applications in the range of 100 to 500 VAC. However, the prices are generally $2 USD per joule compared to common electrolytic capacitors of $.20+ USD per joule, on the surplus market. This capacitor bank is six parallel 50 uF polypropylene capacitors rated for 400 volts. 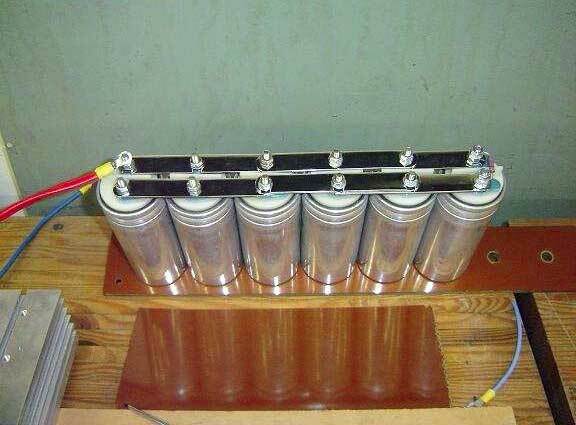 Each capacitor can store 4.2 Joules, for a total stage energy of 25.2 joules at maximum charge. 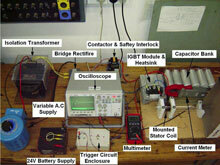 Most testing was done at lower voltages, to protect the system until it was fully analyzed. Interestingly, his initial "busbar" connections were built of crimped spade lugs, but this appeared to add a few milliohms of resistance, and were replaced with large solid bars as shown in this photo. To avoid losses due to skin effect, the system is designed to limit frequencies to 3.2kHz or less. 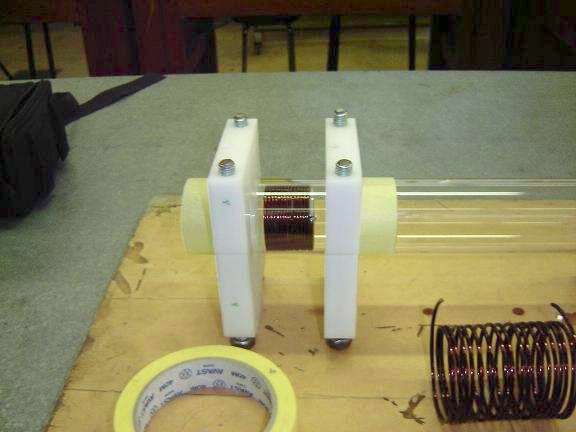 The skin effect at higher frequencies would create losses due to a decrease in effective current conducting area in the wire, and from "dead weight" of copper on the armature coil. He derived differential state equations (detailed in his PDF file) for the system, based on modeling techniques found in IEEE journals. These equations allow you to simulate the entire system, from which resonant frequency and other figures of merit could be estimated. After analysis and modeling, the goal was to reach 3.5% efficiency from the first stage. This seems reasonable if not conservative, and is expected to be an achievable figure. Some literature references suggest operating efficiencies above 50% could be reachable, although perhaps not in the first stage. An efficiency of 3.5% is higher than typical switched-reluctance coilguns, and probably much lower that what can eventually be built. The researched literature reports that optimization simulations will typically converge on coil pairs that have more or less the same length, in addition to both coils being thin rather than thick. Braam investigated various sizes around that point to find a local optimum for his desired coilgun size. He suggests that a breeder algorithm for optimization would be a valuable addition to the analysis methods. The stator (shown at right) was built on a thin-walled Perspex cyclinder. The armature coil forms (at left) were designed for minimum weight while meeting the strength requirements. His thesis explains how to analyze the compressive forces expected during launch. Braam's thesis contains a considerable amount of detail and derivation, and anyone planning to build a PLIM would benefit by studying it carefully. The initial results were hampered by failures in the IGBT, leading to careful redesign of the semiconductor's triggering circuits. But more importantly, the damping factor was greater than desired, apparently due to losses in the silicon switch. However, this agreed with simulations that showed that a small tank circuit resistance of even 25 milliohms (excluding stator coil of 11 m-ohm) would lead to excessive damping and thus poorer performance. With an IGBT trigger refinement, the final results were disappointing. The armature moved, but not enough to get meaningful kinetic energy measurements. Later testing after the thesis was finished was much more encouraging. Braam replaced the IGBT with a large-area mechanical contactor switch. This deserves a great deal more attention and development to improve performance of PLIM coilguns. In my opinion, I'm positive there are good effective copper switches for high-current high-voltage applications like this. Of course, a mechanical switch is only useful in the first stage, and will be ineffective on subsequent stages due to their slow response time. Please send your compliments to Braam Daniels for an outstanding job of researching PLIM technology, building a high-quality robust demonstrator, and documenting his process and findings in an extremely useful manner for hobbyists.